At a scheduled chat held on Twitter by the Diabetes Social Media Advocacy (DSMA) folks held on Weds., November 3, 2010 (see HERE), one of the topics was related to pharmaceutical companies and social media. There is a great deal of well-deserved skepticism about pharma's über-lusty interest in largely patient-controlled social media space, because right now, they do not engage in much two-way conversation which is at the very heart of what social media is all about (see HERE for more). Presently, pharma is trying to use social media as an advertising channel which does not accept comments, to talk AT patients, not WITH them. Needless to say, this type of communication really does not fly in social media, so most pharma social media efforts have bombed royally. Many claim they do not accept comments to protect adverse reporting which must be directed to the FDA, but many patients suspect that's a cop out because they want the FDA to issue formal guidance that will absolve the industry of any legal liability for what is really little more than common-sense behavior in the social media space. Anyway, in the chat, there were many comments on the theme of how pharma isn't interested in cures, just in selling more product. I commented that I felt the profits in a cure would blow away those earned on selling the next-best-treatment which has pretty much been the diabetes model since the discovery of insulin in 1921. Conventional wisdom among people with diabetes (PWDs) is that because diabetes is such a huge cash cow for the drug, biotech and medical device companies that this industry (some call it "Dia-Business", the "Diabetes Industry" ... Diabetic Investor David Kliff once even referred to it as the "Diabetes Industrial Complex") that there's no chance of a cure coming from any of these companies who are the biggest financial beneficiaries of keeping patients chronically ill, but never cured. Many just lump all of it together under the collective umbrella of "Big Pharma"), but the idea is that because the industry makes so much money from keeping people with diabetes just well enough to survive, that they are knowingly not pursuing curative therapies. I don't believe this to be true. But before I delve into that, perhaps I should share some relevant historical (that's relative, I'll only go back earlier in the last decade) perspective. Back in October 2003, a very popular article by author Dara Mayers entitled "Would You Cure A Profitable Disease?" was published in Diabetes Health magazine (the magazine was still known as "Diabetes Interview" back in those days) explored this topic. The author, Ms. Mayers, tried to be objective, but still suggested that profits were a big dis-incentive to the diabetes industry, thus discouraging at least this segment from actually seeking a cure. She wrote: "Nonetheless, cures for type 1 and type 2 do not seem to be coming from the pharmaceutical industry." However, that logic is a tad hypocritical (a bit like the pot calling the kettle black), as neither federally-funded researchers, nor researchers funded by non-profits at universities and/or other research centers have managed to find a cure yet, so pharma is in exactly the same boat. Prospects for drug and biotech companies look very rosy indeed because of demographic growth in the elderly population (which account for about 33% of all drug industry sales anyway, but is expected to grow rapidly as the Baby Boom heads into retirement and their senior years) as well as huge potential for new drugs stemming from discoveries in genomics and biotechnology. There is little doubt that manufacturers have aggressively raised prices to increase their margins, although there is little solid evidence of actual financial benefits to healthcare providers who are footing the bill for their "new and improved" products. That's exactly what has happened with former commody products like insulin. Whether its good or bad is irrelevant; businesses have logically chosen to increase their margins because they have a fiduciary responsibility to do so, and if they can get away with it, why not? But increasing margins on old products can only work in a non-competitive environment. Pharmaceuticals is already one of the widest-margin U.S. industries, and as long as these companies enjoy monopolies, that can occur. Patent expiration has historically slashed the prices on widely-used medicines. Now, thanks to The Patient Protection and Affordable Care Act (the so-called healthcare reform legislation sometimes derided by opposition as "Obamacare") which was signed into law by President Obama on March 23, 2010 contains a section called the "Biologics Price Competition and Innovation Act of 2009" (a.k.a. BPCI Act), that's pretty certain to change. That legislation amends the Public Health Service Act, and the Federal Food Drug and Cosmetics Act to create an abbreviated approval pathway for biologic products that are demonstrated to be "highly similar" (biosimilar) to, or "interchangeable" with an FDA-approved biological product. Whether any biologics can EVER be considered "interchangable" remains an unclear, although the FDA has in the past hinted that would not be the case (see HERE). Regardless, since this is now law, it means the FDA is now obliged by U.S. law to provide guidance for follow-on biopharmaceuticals (generics) inclduing insulin, which has potential to reduce costs significantly, so the era of 10% annual price increases may soon come to an end, especially since the patents on most pricey insulin analogues are due to expire in the next few years (see HERE). 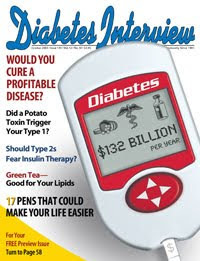 Is Diabetes Too Profitable to Cure? Aside from fatter profit margins, in the grand scheme of things, when one compares the margins on chronic medicines to those of specialty medicines (think of things like cancer treatments, which are given quite rarely to a relatively small number of patients), the margins are comparatively low on chronic medicines, but much higher on specialty medications like cancer treatments. Thus, if one could transform a disease like diabetes from being a chronic disease to a curable disease, it's safe to presume that a curative medicine(s) would be among the world's biggest blockbusters, making today's blockbusters like Pfizer's Lipitor look pretty miniscule by comparison. In fact, a diabetes cure (or cures) might possibly be some of the biggest blockbusters the drug and/or biotech industry has ever witnessed. And there is a rapidly growing number of companies whose very business models do not exactly focus on keeping patients chronically ill, but on eradicating their diseases. They haven't succeeded ... yet, but these companies see enormous profits in bringing cures to market. Finally, the drug industry doesn't hold secret, backroom meetings about how to keep would-be competitors out of their business; they are fiercely competitive with each other, and there are genuine risks that Federal antitrust regulators would step in if they acted in a truly anticompetitive manner, which does serve as a natural control mechanism. It also seems unlikely that any drug company would want to tip off their competitors what they plan or are researching unless it's pretty far along in development and already in the public domain. To cure type 1 diabetes, the consensus among researchers is that two things need to happen: 1) first, the autoimmune response that caused the disease to occur in the first place must be fixed, creating a state of "self-tolerance" to islets/pancreatic beta cells and 2) second, the functionality of the destroyed islets/pancreatic beta cells must either be replaced with new islets, or restored via regeneration. There are a variety of companies, many of which are startups, pursuing various parts of this equation. For example, on islet replacement, there are companies who are pursuing xenotransplantation by encapsulating islets from another species (such as pigs, whose insulin is more similar to regular human insulin than some insulin analogues like Novolog, Apidra, Lantus or Levemir based on amino acids and molecular weight). Listed below are a number of companies operating in various spaces in the cure-related therapies (by category). Living Cell Technologies (LCT), a publicly-held firm based in New Zealand but listed on the Sydney, Australia stock-exchange. In addition, others are trying a slightly different route, developing what they are calling Islet Sheet Technologies. Several companies which are not publicly-held firms are pursuing this technology. While it does not appear they are quite as far along as LCT, fellow d-blogger Elizabeth Snouffer did a great piece back in April 2010 about Islet Sheet Technology. Visit her post HERE for more details. Among the firms she writes about are Scott King's (NOT the former editor of Diabetes Health magazine, the OTHER Scott King heading up a firm known as Cerco Medical). Both involve masking islets to protect the transplanted cells from immune response. The long-term viability is still being researched, but could potentially be replaced without major surgery. Tolerx, Inc. is another firm based in Cambridge, Massachusetts that has a similar, but not identical approach to addressing the autoimmune response that causes type 1 diabetes. Tolerx claims to have a slightly different approach, and was paired with GlaxoSmithKline plc thanks to the JDRF. The company's Phase III human clinical trials are reportedly complete, although the trial results have not yet been released to the public. (Note: in March 2011, Tolerx and GSK ANNOUNCED that otelixizumab had failed to meet its primary efficacy endpoint, although full details will be announced at the American Diabetes Association's Scientific Sessions taking place in June 2011). Another privately-held firm, DiaKine Therapeutics, Inc. has several products for diabetes in it's development pipeline. On the autoimmunity front is a product known as lisofylline (LSF), which the company describes as a synthetic small molecule with "novel" anti-inflammatory properties that may work in stopping the autoimmune response that causes type 1 diabetes. This is presently in Phase II human clinical trials according to the U.S. Government's ClinicalTrials.gov site, so it has a longer development timeframe than Tolerx's product. In March 2009, the JDRF announced a partnership on another autoimmunity treatment from Bayhill Therapeutics, Inc. and what was then known as Genentech (now part of Roche). Known by the unglamorous name "BHT-3021" which differs slightly in that it works as an antigen-specific treatment for the insulin molecule itself. However, details on progress have been few and far between on this treatment. July 2011 Update: Following disappointing results for both the Macrogenics and Tolerx treatments (though the Macrogenics treatment will go back to trials with funding from the National Institutes of Health, suggesting that there may be some evidence that this treatment was not a total failure), in June and July 2011, there were two new autoimmunity partnership deals announced, the first via the JDRF, the second via the Iacocca Foundation. The first one was with a Watertown, Massachusetts-based biotech company named Selecta Biosciences, Inc. for the development of an type 1 diabetes autoimmunity vaccine technology. The other was ANNOUNCED on July 19, 2011 where The Iacocca Family Foundation boosted investment in a Seattle-based biotech firm known as Kineta, Inc. which also has an autoimmunity treatment known by the acronym "ShK-186" in development which is being developed not only for type 1 diabetes, but several other autoimmune diseases as well. For more detail, see the press release HERE. Transition Therapeutics, Inc., a Toronto (Ontario), Canada-based biotech startup, is a privately-held firm funded by venture capitalists. Exsulin Corporation based in Burnsville, Minnestota is another privately-held firm that is majority owned by a limited liability corporation (LLC) known as Kinexum, LLC which is based in Harpers Ferry, West Virgina (in the Washington, DC exurbs). CureDM, Inc., based in Wilmington, Delaware developing a product they call Pancreate™ (proisletide acetate). In April 2010, the firm signed a commercialization agreement with Franco-German global pharmaceutical giant Sanofi Aventis S.A. best known as the maker of Lantus and Apidra insulin analogues. So Where Are the Cures? All of this begs the question: where are the cures, then? This year, one of my favorite medical writers, Sharon Begley, who writes for Newsweek magazine, but previously wrote for such well-known newspapers as The Washington Post and The Wall Street Journal, looked directly at this question. 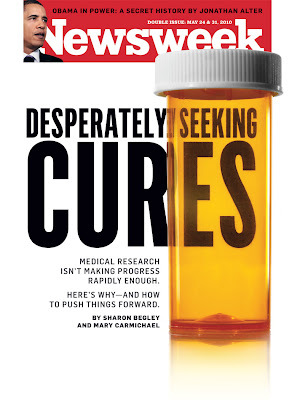 In the May 15, 2010 issue of Newsweek, the cover story was hers and entitled, appropriately enough "Desperately Seeking Cures", probing into why the road from promising scientific breakthroughs to real-world remedies has become all but a dead-end (those are her words, not mine!). In fact, she even cited stats from the FDA, stating that from 1996 to 1999, the U.S. Food and Drug Administration approved 157 new drugs. In the comparable period a decade later—that is, from 2006 to 2009—the agency approved 74. Not among them were any cures, or even meaningfully effective treatments, for Alzheimer's disease, lung or pancreatic cancer, Parkinson's disease, Huntington's disease, diabetes or a host of other afflictions that destroy lives. Her story found several culprits, most notable was the fact that the nation's biomedical funding and training system are set up to do one thing, and she notes that they do that superlatively: make discoveries. Back in 2008, Ms. Begley wrote another story with a similar title, although less in-depth "Where Are the Cures?". In that article, she wrote "Discoveries is what scientists dream of, that is what gets them published in leading journals (the coin of the realm in academia) and that is what gets them grants from the National Institutes of Health. She added that the less glamorous work of testing potential treatments in actual patients -- the grunt work, as she referred to it, that turns a breakthrough into something that can actually be tried in patients is seldom on their academic agenda. That responsibility falls elsewhere, and helps explain why so much money is spent yet few cures ever seem to emerge from the billions we spend. Another factor: the nation's patent system, which tends to reject applications that are already published in scientific and medical journals that helps researchers advance their own careers, and without patent protection, hardly any drug or biotech company would be interested. Then there is a not-so-little matter of licensing discoveries from NIH-funded research; sometimes startup firms see potential in these discoveries, but cannot afford big upfront payments that a big drug company like Pfizer or Lilly could afford, and the NIH has been asking as if all companies had Pfizer's pockets. "NIH has no skin in the game, so they have no inducement to work with a company" to get a discovery from the lab to patients, says Eric Gulve, president of BioGenerator, a nonprofit in St. Louis that advises and provides seed money for biotech startups. "There isn't a sense of urgency." A top lab chief at the NIH laments that when scientists like himself push the licensing office to move a discovery toward commercialization, "it's just another piece of paper to them." Without the license, the startup struggles to stay alive. Of course, Ms. Begley did mention how an increasing numbers of nonprofit organizations are trying to fund the next steps in "translational research". Among them is a big one in type 1 diabetes research: the Juvenile Diabetes Research Foundation (JDRF). Increasingly, nonprofits like JDRF are stepping in to fund the research needed to take promising concepts from discovery to commercialization, filling a badly-needed void. In fact, Ms. Begley wrote an entire article on that very subject back when she was still writing for The Wall Street Journal back in 2007 entitled "Why Nonprofits Fund For-Profit Companies Doing Drug Research" in which the JDRF along with others like the Michael J. Fox Foundation for Parkinson's Research, and the Myelin Repair Foundation (for multiple sclerosis) who have all veered away from the NIH model of "here's some money; go discover something." "Charities realize that writing checks to for-profits might not be what their donors had in mind. 'We debated whether it was right for our money to go to a company that might make a profit,' says JDRF board member Michael White. 'We're not unconcerned about that. But we've invested so much in discovery, what we need now is to take these things to market. We're taking on the role of 'venture philanthropists.'" And not all of these investments will even pay off; for a very relavant example, as already noted, on October 20, 2010, MacroGenics, Inc. and it's big pharma partner, Eli Lilly and Company announced that a potential autoimmunity treatment called teplizumab, whose Phase III human clinical trial called Protégé, did NOT meet the primary efficacy endpoint of the study, which was a composite of a patient's total daily insulin usage and HbA1c level at 12 months (see HERE for more detail). A similar treatment from a startup called Tolerx and it's big pharma partner (thanks to the JDRF's involvement) GlaxoSmithKline remains upbeat about their own treatment, called otelixizumab, is wrapping up analysis of it's own Phase III human clinical trial called DEFEND. One key unresolved pitfall Sharon Begley wrote about: "blockbuster-itis" in the drug industry, but it appears that experience may have taught non-profits how to prevent pharma "blockbuster-itis" from killing the goose that lays the golden cure egg. Egg on the JDRF's Face? Occasionally, the big pharma company will do something that really p!$$es their nonprofit "partner" off in their relentless drive for fat profits. In one JDRF program for islet regeneration efforts, the Toronto-based biotech startup known as Transition Therapeutics, which JDRF partnered with Eli Lilly & Company, did see fairly solid evidence of efficacy of it's gastrin-based therapies in patients with both type 1 diabetes as well as type 2 diabetes. But then big-pharma partner Eli Lilly & Company decided to push clinical trials towards type 2 diabetes and cancelling the type 1 trials, theorizing that it could potentially sell the product to far more type 2's than patients with type 1, thus increasing the company's bottom line faster. The company likely assumed if is eventually approved for that indication, then they could then move to "extend" the drug's label approval to type 1 patients, albeit that could take many years more, which was not quite what the JDRF had in mind when pairing these organizations together. In fact, JDRF had invested fundraiser dollars in the program only to see clinical trials in type 1 patients cancelled by a greedy pharma partner. Of course, things were easier before patient-bloggers hit the scene. For example, last autumn (2009), fellow diabetes blogger Joshua Levy and I speculated on what Lilly's move meant as trial results for Transition Therapeutics treatment known as TT-223 and the fact that they pulled the plug on the type 1 trial. I actually wrote about it in my mid-year progress report. Bill Ahearn is the Vice President, Strategic Communications for JDRF International went so far as to contact Joshua Levy in the comments on his blog about the Transition Therapeutics approach, while I received an e-mail from another JDRF staffer with very similar comments. Had this occurred a decade ago, the organization might have controlled the dialog either by ignoring it and allowing it to pass, or with carefully-scripted press releases. But it became a public relations disaster for the organization, and patient bloggers effectively forced the JDRF to confront it head-on, as these things had gone viral, hence the response. To be sure, there is no prior, proven pathway for "venture philanthropists" as JDRF called themselves (in Ms. Begley's 2007 Wall Street Journal article), so one can call this a training exercise for JDRF's Industry Discovery and Development Partnerships (IDDP) program. No doubt, the JDRF was embarrassed by Lilly's move and had to do damage control as a result. But this move demonstrates the power that the social media space (including patient bloggers) has had on even nonprofit organizations. Although the investment was reportedly relatively small and Lilly's interest in the treatment (especially now that the company faces a "patent cliff") could bring it to market, where it could then be researched "off-label" in the type 1 universe, thereby saving Lilly millions. If it does not gain approval for type 2 diabetes, that does not necessarily mean the drug would be dead, either (although Lilly might loose interest by then) forcing the JDRF to find a new pharmaceutical partner. One thing is certain: JDRF probably learned it's lesson from this experience. In recent IDDP announcements, virtually all require the partners to meet key milestones before the organization pays any more. This may prevent another of the TT-223 fiasco from occurring on the organization's dime in the future. "Something as big as INGAP won't come cheap. 'We don't anticipate that it will exceed $20,000 for a single course of treatment,' Lisa [Jansa, CEO of Exsulin] told me. Later, however, she is confident that as they scale up production they will be able to bring the cost down." Exsulin also told David Mendosa that the company was not certain if periodic re-treatments might be required, something that current clinical trials may answer. Perhaps with an effective autoimmunity treatment, that need would be eliminated. Right now, we simply do not know the answers to these questions. This is why the term "remission" has become favored by the medical profession over using the term "cure". As former New York Yankees player and manager Yogi Berra once famously said "It ain't over till it's over." But regenerating islets solves only half the type 1 diabetes puzzle; the autoimmunity issue must also be solved, so its possible that the cost of a cure could easily be in the $100,000 range, including any periodically necessary re-treatments for either (or both) components. All of this makes me wonder: will we see an asset-backed securities market emerge for diabetes cures (maybe as "Cure-Backed Securities? "), and how much will for-profit insurance companies be willing to pay for? What if that market works anything like Fannie Mae and Freddie Mac? It seems clear that the margins on any curative therapies are destined to become blockbusters, which means the drug industry's own desire for billion-dollar products may push even more of them into the high-margin cure therapies, rather simply more than new-and-improved versions of lower-margin century-old products, and follow-on biologics will undoubtedly help. We have already seen Lilly, Sanofi Aventis and others partner with startups in curative therapies. It appears that non-profits like the JDRF's experience with Lilly and Transition Therapeutics means the days of writing checks without milestones being met required of pharma partners are permanently over, and not a moment too soon! In a strange way...this post gives me hope lol. Thank you. Sysy, in spite of the price tag, this is an optimistic post but one grounded in reality. A cure for $100,000 might cost half that in 10 years even with inflation. There is interest in this as a business, which is always a good thing! Looking at the analogy of Cancer, there's another dark side here. Most of the cancer "cures" achieved at great expense turn out to be for cancers that left alone probably wouldn't have killed the patient. The cancer industry keeps hidden from the legions of breast cancer "survivors" that the kind of in situ cancer older women get grows very slowly and is an entirely different disease than the fast moving form that kills the young. The same is true with prostate cancer. Men are being sold expensive and destructive treatments for slow growing cancers that left alone wouldn't kill them. Doctors profit from chemo and sell them with subtle messages, "You can leave it alone, and maybe you'll be okay, BUT..."
So one can imagine that "cures" will come up for the huge numbers of cases of "pre-diabetes" which never progress to actual diabetes (2/3 of the adult population is insulin resistant, less than 1 in 10 develop Type 2.) Whether severe diabetes of either type will be cured is less likely. I think that although there is promise in "cure" therapies, we all need to be aware of what the motive of the seller of these treatments actually is: making money. For example, in the autoimmunity front, most of the antibody treatments being tested have adverse effects--recurrent mononucleosis, for example. There is also reason to be skeptical of label extensions of ANY drug, and we should remember that any curative therapies are likely to be first-generation treatments whose long-term effects will be proven only after being tried on thousands of patients. While I am cautiously optimistic in all of this, I am not looking at them with blind faith alone. Investors driving these companies want to ensure they are compensated, sometimes far more than they are legitimately entitled to, but anything that changes the paradigm of new-and-improved but perpetual treatment is a step in the right direction in my opinion. But I'm not certain I'll be first in line for any of these treatments! Wow you covered a lot of ground here! I am looking for the day when more adult T1 patients back/fund/promote or just show greater interest in research and development. Traditionally it has been parents of children who do most of the fund-raising and they have been successful in $$$ but not in finding the right avenue. Now that 40-50 years have passed and the first and second generation of T1 children have reached prime income days (that's me and you in age regardless of income) - I hope that patients themselves will do more for the cure - either financially or advocacy/development work. Thanks for the mention. The big Health industry is kicking themeselves and learned a valuable lesson when they let Jonas Salk develope a vaccines to prevent polio. Never again and certainly not with Cancer Aids, Diabetes or the common cold.